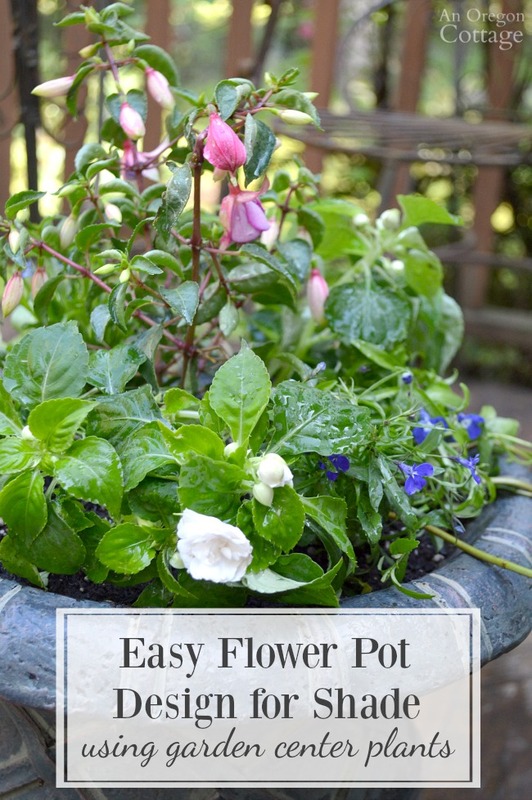 Use this flower pot design for shade “recipe” and tips to easily plant a container with inexpensive garden center flowers that will look good all season. 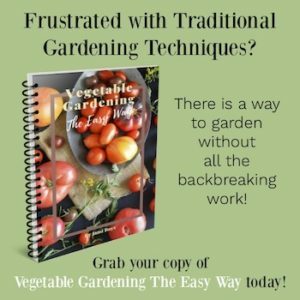 This article is sponsored by Fiskars and Gilmour who have products I’ve found that make gardening easier – always a good thing! Thank you for supporting the companies that make An Oregon Cottage possible. 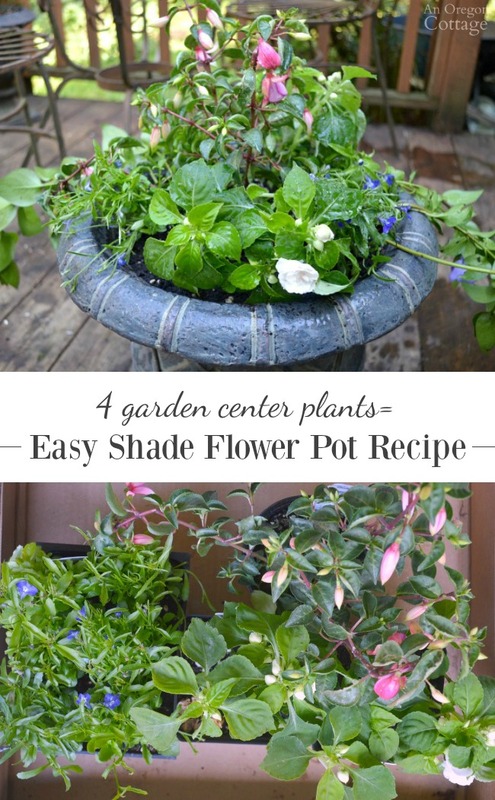 Since sharing the simple flower pot design for sun planter recipe, I heard from a number of you that agreed with me – it’s great to create pretty flower containers that use basic garden center plants. 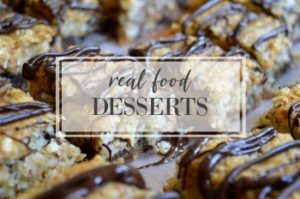 Maybe we should call these the “comfort food for planters?” There’s a nostalgia and joy that comes from looking forward to our reliable favorites every year, just like we look forward to grandma’s Tasty Rice or the best cinnamon rolls. Of course, it may be just a matter of time and money – but that doesn’t sound so poetic, does it? 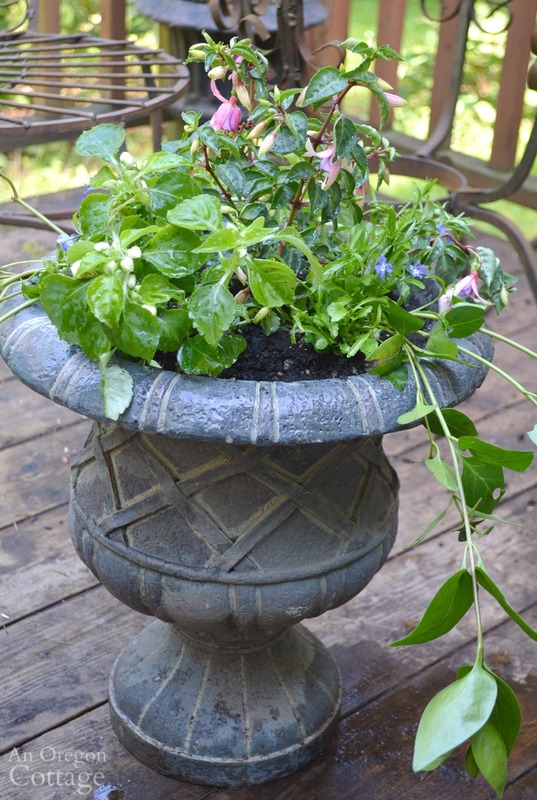 No matter why, getting your plants from garden centers can result in beautiful planters. And since I know you don’t have only sunny areas, how about a planter designed for shade? 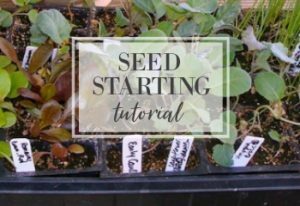 Below you will find the supplies you need (similar to the sun container recipe), the exact plants to buy for your flower pot design for shade and planting tips. The tips for choosing the plants for sun also apply here: look for 1-2 tall plants for the center of the pot (“thrillers”), 2-3 medium-height plants (“fillers”), and 3-4 trailing plants (“spillers”). Tip: Place all the plants in a box and look at them from above to see how the colors coordinate together. Change out the colors as you like until you get a pleasing color combination. You can think about the color wheel if it helps: choose complimentary colors like yellow-purple and blue-orange, or shades of colors in purples or pinks. When you take the time to look at the flowers together, you will probably see that some just don’t work well together – shades of salmon-orange, for example, don’t go well with some pinks. Note: Some links in this article are affiliate links and if you click on them I will receive a small commission at no cost to you – thanks for your support! Trowel, soil scoop, pruners and/or plant snips. The Fiskars trowel I use has a soft grip and is heavy duty enough that I feel confident digging in our clay soil without having the handle break like other towels I’ve used. And I find that the small micro-tip pruning snips are perfect for container planting like this – they get in easily to trim any stems that were broken during planting and make deadheading spent flowers go quickly without mistakenly cutting other stems. Have you seen these? One hand easily turns it on and you can control the flow through your thumb as well by not pulling the bar all the way down. It is hands-down (is that a pun?) the easiest waterer I’ve ever used. 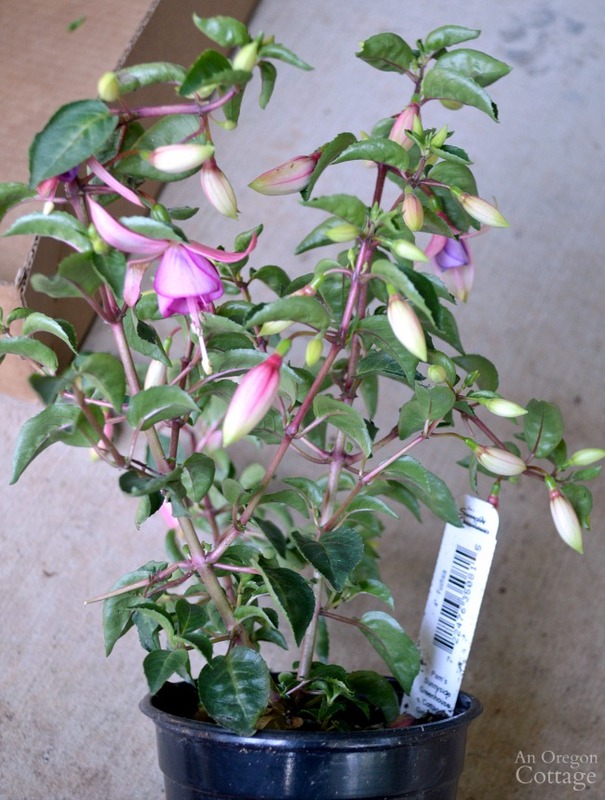 Upright Fuchsia (1), 4-inch pot $2.49. In shades of pinks, purples, and whites upright fuchsias go with many other flowers. Find growing information here. Tip: Choose one that has a few blooms, but more buds so you know it will put out a lot of blooms for you. Impatiens (2) 3-inch pots $2.99. 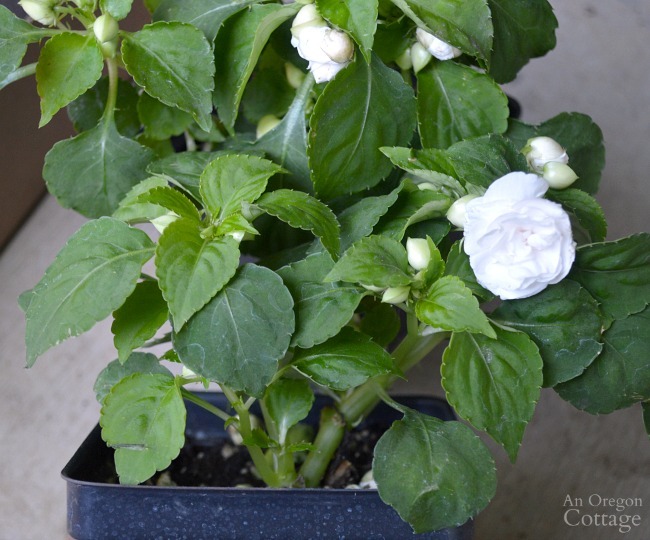 Use either the double rose-like variety shown above or regular single impatiens in any color you’d like. Growing info here. Trailing Lobelia (3), $2.99 6-pack. This comes in various shades of purples and blues (and also sometimes white), so you’ll need to choose a shade that goes with your other flowers. If using the same pink-white-purple scheme like mine, it’s not as crucial. Growing information here. 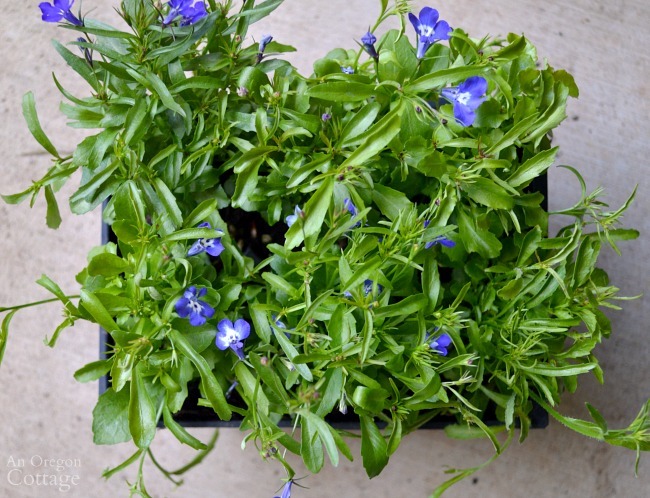 Vinca Minor (not pictured) (2), $1.09 2-inch ‘basket filler.’ This is optional, but will give some immediate trailing stems to your container while the lobelia grows. Vinca can be invasive in some areas when planted in the ground, but grown in containers it makes a nice trailing plant with light purple flowers. Growing information here. Tip: make sure to read the plant tag for the lobelia, since there are upright varieties, too. You’ll want the trailing variety (ask me how I know this, a-hem). 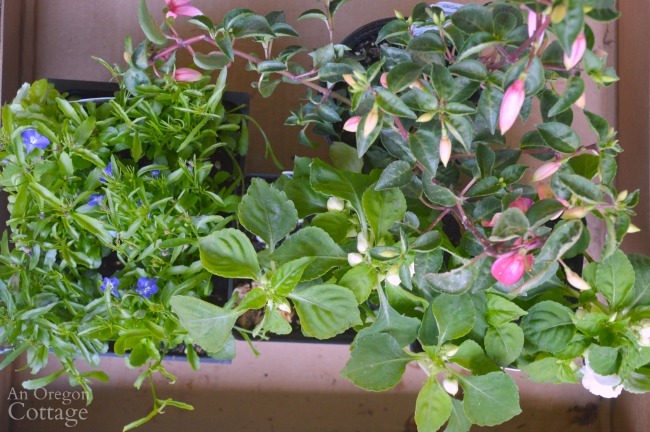 Use the quick video above that shows how to plant these flowers and refer to this article on how to plant containers so that they thrive all season. 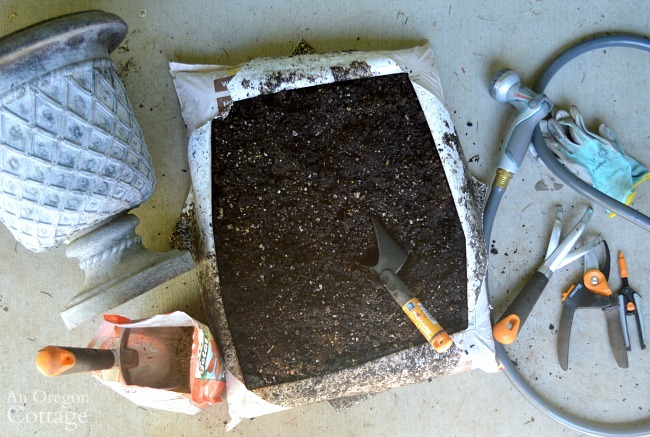 Once all your supplies are ready, it takes only about 10-15 minutes to plant your pot, so it’s a quick return on your time. 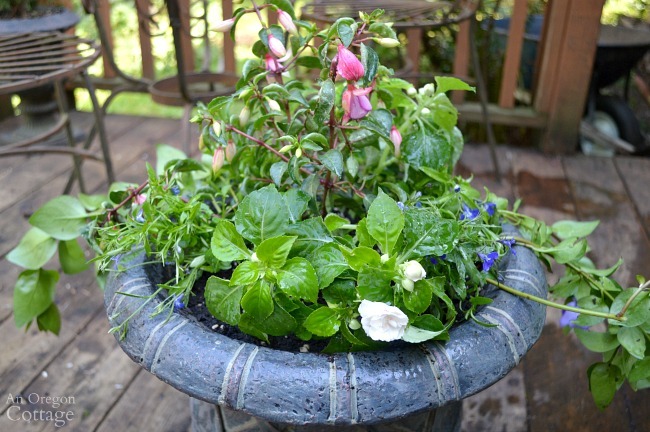 Tip: use a medium sized pot (14 to 16 inches) and fill it with flowers – the fuller the better. Remember the pre-planted pots we see at the nursery? They look so good because they are full. And then all that’s left is to enjoy your creation. Well, with regular watering and deadheading (i.e., removing the dead flowers). I always find that’s the enjoyable part, though – summer evenings watering pots and snipping here and there is something I look forward to after months and months of Oregon rain! I hope you let me know if you use this flower pot design for shade recipe – I’d love to see what colors you use! To share, you can upload a photo to AOC’s Facebook page, or tag @anoregoncottage on Instagram or Twitter and use #anoregoncottage so I can see it! Be sure to visit Fiskars to see more lawn and gardening products and Gilmour for all your watering needs – I love the quality and selection of their products or I wouldn’t be sharing them with you! Disclosure: I received product and/or compensation for this post. As always, the opinions, thoughts, and projects are all mine and I will NEVER promote something I don’t love and think you will find helpful – promise! This post also contains affiliate links and by clicking on them you help support AOC at no extra cost to you! For more info, you can read our entire disclosure page here. Interesting. “Comfort” flowers. Old standbys. Hadn’t thought in that way but you’re absolutely right! I love your combo pictured. Thanks for sharing!